The Middle Ages were characterized by growing institutional sophistication, and nowhere was this more apparent than the craft of war. The image made familiar by Ferdinand Lot and Sir Charles Oman, of medieval warfare as featuring limited discipline, simple tactics, and no strategy at all, has given way to a growing appreciation of the complexity of military operations between the eighth and the sixteenth centuries.1 More and more medieval leaders are emerging from the shadows of romance as solid, competent captains. Even Richard the Lion-Hearted is now presented as a strategist comparable to Bernard Law Montgomery-a juxtaposition not necessarily favoring the latter! 2 The parallel reflects the high cost of medieval armies relative to a given political system’s mobilizable resources. Like the twentieth-century British marshal, no medieval commander could afford to lose men heedlessly. Large-scale battles were exceptional because of their risk-a risk enhanced by the high development of the science of fortification. An enemy defeated in the field was likely to escape decisive consequences by withdrawing behind defenses whose reduction involved massive expenses of time and effort. Cohesion, in short, became an increasingly important element of medieval armed forces. Yet the techniques for achieving this cohesion have been relatively ignored by military historians more concerned with operational results. This essay proposes to examine the structure of medieval Europe’s military systems – and the factors that held medieval armed forces together in battle and on campaign. The noble man-at-arms, far from being an isolated individual, increasingly became the focal point of a small administrative unit and combat team, the lance. Beginning informally, incorporating the knight and a few personal attendants, the lance evolved in France by the middle of the fifteenth century into a man-at-arms, a squire, a page, two or three mounted archers, and a servant. 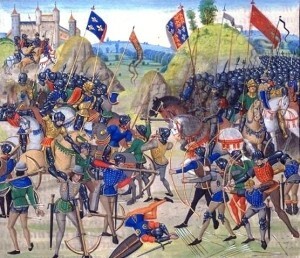 A Burgundian lance could include as many as nine men, each with a specific operational function. On campaign, lances were grouped into conroys, usually of twenty-five to eighty men-more or less permanent bodies. The importance of these structures must not be overstated. Medieval armies lacked anything like a comprehensive command structure able to evoke general, conditioned responses. Coherence in even the lance, to say nothing of larger formations, depended on mutual loyalties far more than on discipline, drill, or fear of punishment. The heavy cavalry of feudal Europe was nevertheless reasonably successful in developing functional patterns of internal cohesion that combined personal and institutional elements. At their best, however, the civic militias of urban Europe were part-time fighting men. Their tactical skills were correspondingly limited. Their operational effectiveness depended on levels of involvement in war that were contrary to the medieval city’s purpose. Unlike the Roman Republic or the city-states of classical Greece, the medieval city was a commercial, not a political, institution. Civic pride and civic identity ultimately depended on the community’s successful fostering of prosperity. And medieval wars could be ruinously expensive even for the victors. The Lombard League virtually bankrupted itself checking the pretensions of Barbarossa. The Fourth Crusade cost the Republic of Venice far more than any immediate gains in loot or improved trade networks. What were the internal dynamics of these regionally recruited commoner forces? John Keegan suggests that violence in medieval life was sufficiently familiar to make battle less of a shock than in con–temporary western societies, which make substantial efforts to isolate their members from physical combat and physical risk. Johann Huizinga makes a similar point, arguing that the later Middle Ages were a period of violent contrasts, of oscillation between extremes of despair and joy, cruelty and tenderness. Huizinga’s image of a life lived in primary colors reinforces the concept of soldiering as essentially on a continuum with everyday experiences, as opposed to a drastic departure from the norm. This approach, both provocative and debatable, is useful for explaining individual pugnacity. Medieval society was also familiar with collective violence at grass-roots levels. Men, both free and servile, could be summoned to war in the feudal levy, or to defend their home areas from organized military formations, bandits, and even marauding wolf packs. Possession of effective weapons, from knives and daggers to bows and billhooks, was widespread even though their primary and normal functions were those of peace, from cutting bread to reaping grain. Early mercenaries were, as a rule, hired singly for a specific operation or campaign. This, however, posed problems for the employer. Individual recruitment involved significant outlays of time and money. Once in the field, moreover, individual fighters did not automatically sort themselves into the smoothly functioning combat teams required by medieval warfare. Mercenary footmen, as individuals, were no more useful than the average feudal levy. Mercenary knights might be formally integrated into the familiar structure of conroys and battles, but they were bound to that structure by neither ties of blood nor ties of fealty. Whether an individual’s sense of honor and his interpretation of his pledge of service would translate into effective battle discipline was correspondingly questionable. Similar contractual relationships did not necessarily produce a community of attitudes in the mercenary community. In principle, the knightly elite still insisted on an essential distinction between itself as a privileged warrior caste and the rest of secular society. Legal restraints on the social rise of baseborn soldiers existed everywhere in feudal Europe. In principle, commoners were not supposed to fight at all. When they did, they were outside the protection of the laws of war.29 In theory, and often in practice as well, commoners who risked their skins on the battlefield could be slaughtered at will-a process facilitated by the fact that no ransoms could be expected from such men. The process of relocalizing Europe’s drifting mercenaries began in Italy. A symbiotic relationship between soldiers and employers had begun developing there even before the first northern free companies crossed the Alps. Hiring fighters from outside the system limited strains on local social orders already riven by class and family conflict. The cities and city states of northern Italy found little moral or emotional difficulty in negotiating business contracts with soldiers, as they did with so many outsiders. The companies and their captains in turn found easy entry to societies expecting and demanding no pretense of loyalty or allegiance beyond the terms of the contract. The military situation in late-medieval Italy highlighted war’s slow pace everywhere in Europe. Strategically, the existence of professional soldiers fighting for pay combined with the growing financial power of the state to foster the extension of campaigning. A government could keep the field as long as its money and its promises held out-even longer if it could carry the fight to its enemy’s territory, as the English demonstrated during the Hundred Years’ War.33 Tactically, armies were evolving into defensive instruments by choice and necessity. Taking the fight to the enemy had little to recommend it in a period where armies were not only essentially alike in structure and doctrine, but lacked a generally effective offensive instrument. Heavy cavalry, long the master of the battlefield, could now be checked as a matter of course. The Hussite Wars demonstrated that even improvised levies could stop a mounted charge in the open. Religious enthusiasm was less a factor in the Taborites’ success than their armored wagons, which provided both an organizational framework and a tactical rallying point. The battlefield consequences, however, were the same.34 Further west, the municipal infantry of Italy and Flanders never developed a significant offensive capability. Caught in the open, as at Mons-en-Pevele (1304) and Cassel (1328), Flemish infantry were cut to pieces by French men-at-arms who had learned respect for their enemies at Courtrai. Across the English Channel, Scottish pike masses proved consistently unable to push home a charge against moderately well-supported longbowmen. Close ranges combined with the valor of desperation to give English arrow flights an effect virtually equivalent to machine-gun fire against the lowland schiltrons, setting the vaunted furor scoticus at naught time and again. In sum, the most potentially dangerous offensive forces on a battlefield, massed armored horsemen and massed infantry armed with shock weapons, had become systematically vulnerable to flexible combined-arms tactics. These tactics were increasingly feasible for the professional soldiers who filled the ranks of the mercenary companies. The English combination of longbowmen and dismounted men-at–arms, which proved so formidable on the defensive against French chivalry and Scots pikemen alike, was only a beginning. Mounted archers, light cavalry, crossbowmen whose quarrels could smash through plate armor, hand gunners in increasing numbers-all found their places in the order of battle. By the middle of the fourteenth century, the up-to-date army was an interrelated structure of different arms, each increasingly possessing its own quirks and its own vulnerabilities. As his armor grew more complex and his horse grew larger, the heavy cavalryman evolved from the all-purpose warrior of the eleventh century into a rough analog of the modern battle tank: an important element of a balanced army, but dependent on the cooperation of light horsemen and missile-firing infantry to achieve consistent results. On all but the roughest ground, archers needed the protection of either men at arms or heavily armed infantry, pikemen or billmen. These in turn required support to minimize the risks of being shot down or ridden over. The next development in military coherence began with the evolution of a generally effective offensive force with a regional base. This was the pikemen of the Swiss cantons. Paradoxically, the Swiss initially earned their military reputation in a local context, and with an entirely different weapon. The victory of Morgarten (1315) was won when Leopold of Austria marched into a narrow defile and saw his men mowed down like grain by the halberdiers of the forest cantons. The next step came when the forest cantons formed alliances with the cantons and cities of the Swiss lowlands. Like their counterparts in Flanders and Italy, these areas furnished contingents of spearmen. The superiority of this weapon to the halberd was demonstrated at Laupen in 1339. Unable to keep the Burgundian heavy cavalry from coming to close quarters, the halberdiers of Uri, Unterwalden, and Schwyz were saved from destruction by the lowlanders’ pikes. Such tactical triumphs could not overcome the essential weakness of the evolving Swiss military system. The Swiss economy could not afford to keep masses of men under arms for any length of time. A war of attrition meant corresponding risks of starvation as fields went unsown and crops ungathered. The Swiss, moveover, had little hope of matching their Burgundian rivals in operational sophistication. Swiss infantry, unable to attack in the open field, would have to depend on archers for fire support and heavy cavalry for shock power. These military skills were scarce in the Swiss mountains. Nor could the cantons afford to hire specialists, as did the Burgundians. Pressure to transform the Swiss infantrymen into an offensive weapon was further heightened by a human factor. Unlike soldiers from the rich cities of Lombardy and Flanders, few Swiss could afford defensive body armor. To survive physically, the Swiss fighting man had to deliver blows. Through the fourteenth century, Swiss cantons and Swiss captains developed patterns of discipline and training enabling their infantry to attack as well as counterattack. The men of a Swiss pike column knew that life as well as victory depended on an ability to move quickly and in good order. The Swiss soldier was both a free man and enough of a warrior to understand his tactical system and enjoy its implications. This was most frequently manifested in the ferocity generally char–acterizing Swiss military behavior. Far more than their contemporaries in the mercenary companies, the Swiss tended to see themselves as outside existing feudal and military systems, whether challenging or serving them. Swiss out-of-battle discipline was proverbially bad even by fifteenth-century standards, not least because the Swiss had a tendency to run amok en masse. At the same time, a reputation for unbridled ferocity was no mean asset to a system depending on aggressive assault tactics. It not only intimidated enemies; it inspired the Swiss themselves. The Swiss first established their reputation as more than a locally formidable force in 1444 at St. Jacob-en-Birs, where less than a thousand pikemen attacked a state-of-the-art French army 15,000 strong. The Swiss died to a man, but took 2,000 foes with them. Military Europe began to take notice – and make offers. The Swiss responded by improving their specialized skills. They adopted an early version of Schwerpunkt tactics, striking what seemed the most vulnerable point in an enemy position twice, sometimes three times in succession. They increased the length of their pikes to fifteen, then to eighteen feet. They enhanced the fire support of their assault columns with crossbows, and increasingly with handguns. Like the longbow in England, the handgun penetrated Swiss civil society largely because of its perceived utility in war. Firearms, however, remained secondary to pikes. And the pikes’ effectiveness depended on battlefield cohesion. Swiss success not only inspired but demanded emulation. The Swiss filled too large a gap in the specialized orders of battle that characterized late-medieval armies to be shrugged off as regionally limited. Swiss pikemen were, however, expensive enough and refractory enough to encourage governments to seek substitutes. Unlike the English longbow, moreover, the basic Swiss weapon did not seem so complex that only conditioning from childhood could develop efficiency in its use. The most familiar Swiss imitators were the Landsknechts. The Hussite Wars generated corresponding interest in new tactical approaches among German professional soldiers. An increasing number of captains in Burgundian or Habsburg service acquired extensive-and painful–direct experience of Swiss methods. In recruiting infantry, they turned increasingly to south Germany, the regions bordering the Swiss cantons from Vorarlberg to the Sundgau. Not every Swiss mercenary went to war through cantonal contracts. Freelance Swiss often served in the same companies with Germans who borrowed techniques from their neighbors. The Landsknecht, however, was part of a drastically different social matrix. Late-medieval Switzerland was a tightly structured society, able at local levels to exercise a significant level of control over individuals. Southwestern Germany in the fifteenth century was experiencing a population explosion. A typical village with 500 inhabitants in 1490 had doubled its population by 1560. Famine and plague provided only episodic relief. Larger families meant smaller inheritances. Underemployment became endemic in communities already suffering economically from the decline of the regional textile industry. Men moved from village to town and back again, looking not only for work but for opportunity. Their search further undermined traditional structures already weakened from internal conflict generated by the introduction of Roman law. Peasant villages were increasingly able to balance among conflicting claims to their labor and their allegiance. Lords and priests, merchants and magistrates, faced consistent challenges to their social and religious authority. This generalized breakdown of deference created a climate favorable to the soldiers’ trade. Landsknechts emerged from a society where possession of knives and swords was universal, and ownership of armor and heavier weapons was common. Not every Landsknecht, moreover, was a dispossessed craftsman or peasant. Burghers’ sons and aristocrats’ sons found places in the ranks. Runaway serfs stood side by side with freeborn men. A recruit’s claims to personal status were unlikely to be closely investigated as long as they were not patently ridiculous. As a common denominator, Landsknechts were men perceiving limited opportunities at home, but who felt they were as good as anyone else with weapons in their hands. But no matter how assembled, a Lands–knecht company of them was still no more than an aggregation of more or less belligerent individuals-an aggregation, moreover, too small to be tactically useful. Medieval contractors and captains had thought in hundreds. Landsknecht officers preparing to compete with the Swiss had to think in thousands. Nor could these men merely be warm bodies. The Swiss depended for their success on aggressiveness and cohesion. How could these be introduced in a Landsknecht force whose very size meant that any pre-existing bonds of dialect and culture would be significantly limited. How could they be sustained among men whose choice of a military life was in large part an affirmation of their personal freedom, their right to drink and gamble, to defend their honor in duels, to wear outrageous clothing, and swagger at will among the women? One answer involved supplanting the community with the regiment. The process began with mustering, where prospective recruits were passed before their officers, read the articles of service and discipline, then ceremonially sworn to their cause and their leaders. A typical Landsknecht regiment consisted of 4,000 men divided into ten companies, each with its own standard as rallying-point and symbol. These companies, or Fahnlein, were in turn subdivided into platoons or Rotten, each of forty men. Where officers of the larger formations were appointed by the colonel-contractor, the Rotten elected their own leaders from among the veterans in their ranks. Other officials, the Fuhrer, the Gemeinwaibel, the Furiere, represented the interests of the common Landsknechts in administrative and operational matters, frequently acting as mediators in disputes with the command structure. Their advice and recommendations were not lightly disregarded by any colonel hoping to exercise effective command over what was essentially a force of free agents. A Landsknecht regiment was not merely a pirate band. Plunder, while still important for the early modern soldier, was increasingly becoming a kind of incentive bonus. Larger armies meant more competition for available loot. Fewer wealthy noblemen now went to war; an aristocratic prisoner was likely to be relatively as impecunious as his captor. While men continued to serve for booty only, it was usually with the hope of being taken on the paid strength of a formation. At least before the general European rise in prices at mid-sixteenth–century, pay for Swiss or Landsknecht compared favorably with craftsmen’s wages, and could be over twice as high as a laborer’s pay. Collecting on time and in something like full was so unlikely that riot and mutiny became for all practical purposes institutionalized among the Landsknechts early in their existence. But to claim their wages in the first place, the Landsknechts had to fight well. Victory might gener–ate at least partial payment of money owed, while defeat usually meant empty pockets for everybody. Profitable employment, moreover, depended heavily on past performances. While individual Landsknechts could always find service, terms were likely to be better as part of a formed body. Formations and commanders with bad reputations found it correspondingly difficult to secure contracts. Discipline was also for the Landsknecht an element of survival. Landsknecht formations, recruited ad hoc, were vulnerable to the pressure of combat, when economic considerations became vague abstractions compared with the visceral desire to survive. Panic, however, meant higher orders of risk for the Landsknechts than almost anyone else. Tactical orders of battle frequently placed them opposite the Swiss, who bitterly despised the imitators of their techniques, and were even less predisposed than usual to show mercy in victory. Cohesion, then, was both a career facilitator and a survival mechanism for the common Landsknecht. Contrary to later myth, the Lands–knechts were not a sworn egalitarian brotherhood. Their complex structure of rights and privileges reflected a correspondingly complex internal hierarchy. Yet if Landsknecht commanders frequently dis–mounted in battle to fight in the front ranks, this was only in part a reflection of the growing vulnerability of the horse. It was also a significant gesture of solidarity with the footmen, a sign of physical commitment to a common purpose. Should positive incentives fail, Landsknecht regiments incorporated a comprehensive disciplinary structure, including a provost and an executioner-officials feared and detested, treated as pariahs without honor, but regarded as necessary by even the most hardened freebooters. The Spanish army and its counterparts were developing along lines whose antecedents can be traced as far back as the collapse of the western Roman Empire. For a thousand years the general conditions of European warfare put high premiums not on heroic anarchy, but on coherence and cooperation. Beginning at one end of the socio-military scale with caste identity, and at the other with regional identities based on common military abilities, armies developed integrating structures that increasingly reflected acquired skills, and attitudes whose desirability was defined by the institution rather than its members. From Roncesvalles to Ravenna and beyond, the study of the internal structures of Europe’s military systems sustains the relevance of S. L. A. Marshall’s often-cited dictum that a soldier known to those around him has the best of reasons to fight well: fear of losing the one thing that he is likely to value more highly than life-his standing as a man among other men committed to a common enterprise. 1. The best recent general treatment is Philippe Contamine, War in the Middle Ages, tr. Michael Jones (Oxford: Blackwell, 1984). 2. John Gillingham, “Richard I and the Science of War in the Middle Ages,” in War and Government in the Middle Ages: Essays in Honour of J. O. Prestwick, ed. J. Gillingham and J. C. Holt (Totowa, N.J.: Barnes and Noble, 1984), 78-91; and Richard the Lionheart_ (London: Weidenfeld, 1978), passim. 3. Theory and practice alike counseled caution in the face of an enemy. See particularly Walter Goffart, “The Date and Purpose of Vetegius’ De Re Militari,” Traditio 33 (1977): 65-100; and John Beeler’s two volumes, Warfare in England, 1066-1189 (Ithaca: Cornell University Press, 1966); and Warfare in Feudal Europe (Ithaca: Cornell University Press, 1971). 4. J. F. Verbruggen, The Art of Warfare in Western Europe During the Middle Ages, tr. S. Willard, S. C. M. Southern (Amsterdam: North Holland, 1977), 82 ff. 5. R. Allen Brown, “The Status of the Norman Knight,” in War and Government in the Middle Ages, 18-32, is at once convincing in its arguments and comprehensive in its survey of French and British literature. A. Borst, ed., Das Rittertum im Mittelalter (Darmstadt: Wissenschaftliche Buchgesellschaft, 1976), has more of a central European focus. Bernard S. Bachrach, “Charles Martel, Mounted Shock Combat, the Stirrup, and Feudalism,” Studies in Medieval and Renaissance History 7 (1970): 49-75, critiques the assumption of a direct link between military technology and social structure. Cf. also G. Duby, The Three Orders: Feudal Society Imagined, tr. A. Goldhammer (Chicago: University of Chicago Press, 1981), 293 ff. ; and Claude Gaier, “La cavalerie lourde en Europe occidentale du Xlle au XlVe siecle: un probleme de mentalite,” Revue Internationale d’Histoire Militaire 34 (1971): 385-96. 6. Charles R. Bowlus, “Two Carolingian Campaigns Reconsidered,” Military Affairs 48 (1984): 121-25; and Bernard S. Bachrach, “Charlemagne’s Cavalry: Myth and Reality,” ibid., 47 (1983): 181-87. 7. Walter Goffart, Barbarians and Romans, A.D. 418-584: The Techniques of Accommodation (Princeton, N.J.: Princeton University Press, 1980), includes an excellent general survey of the literature on this subject. Cf. also E. A. Thompson, “Early Germanic Warfare,” Past and Present 14 (1958): 2-29; and C. 11. Hermann, Deutsche Militdrgeschichte. Eine Einfiihrung, 2d. rev. (Frankfurt: Bernard and Graefe, 1968), 15 ff. 8. Verbruggen, Art of Warfare, 72. 9. J. Bumke, Studien zum Ritterbegriff im 12. and 13. Jahrhundert (Heidelberg: Winter, 1964), is a literary-intellectual survey. Cf. also Benjamin Arnold, German Knighthood, 1050-1300 (New York: Oxford University Press, 1985); E. Lourie, “Medieval Spain: A Society Organized for War,” Past and Present 35 (1966): 54-76; and J. F. Powers, “The Origins and Development of Municipal Military Service in the Leonese and Castilian Reconquest, 800-1250,” Traditio 26 (1970): 91-111. 10. Contamine, War in the Middle Ages, 228 ff., offers an excellent overview of medieval organization and tactics. 11. On this controversial subject, cf. Beeler, Warfare in Feudal Europe, 84, 94-95; Verbruggen, Art of Warfare, 89-90; and as a case study, Bernard S. Bachrach, “The Feigned Retreat at Hastings,” Medieval Studies 33 (1971): 264-67. 12. Michael Burleigh, Prussian Society and the German Order: An Aristocratic Corporation in Crisis c. 1410-1466 (Cambridge: Cambridge University Press, 1984), 111 ff. ; and E. Mascheke, “Die inneren Wandlungen des Deutschen Ritter–ordens,” in Geschichte and Gegenwartsbewusstsein. Festschrift fur Hans Rothfels zum 70. Geburtstag, ed. W Besson, F. Frh. Hiller von Gartringen (Gottingen: Vandenhoek, 1963), 249-77. 13. Verbruggen, Art of Warfare, 125 passim, is a brief comprehensive survey of the communal infantries. Detailed studies include Claude Gaier, Art et organisation militaires dans la principaute de Liege et dans le comte de Looz au Moyen Age (Brussels: Palais des Academies, 1968); and O. P. Waley, “The Army of the Florentine Republic from the Twelfth to the Fourteenth Century,” in Florentine Studies, ed. V Rubenstein (Evanston Ill.: Northwestern University Press, 1968), 70-108. Waley’s The Italian CityRepublics (London: Weidenfeld, 1969), incorporates much general information on respective military systems. 14. R.-H. Bauder, The Economic Development of Medieval Europe (London: Thames, 1971), is a useful overview with an excellent bibliography. Cf. also Yves Renouard, Les hommes d’affaires italiens du Moyen Age (Paris: Colin, 1968); and Henri Pirenne, Early Democracies in the Low Countries: Urban Society and Political Conflict in the Middle Ages and the Renaissance, tr. J. V. Saunders, Torch ed. (New York: Harper, 1963). 15. For the importance of local forces and local knowledge on the Baltic frontier, see Eric Christiansen, The Northern Crusades: The Baltic and the Catholic Frontier, 1100-1525 (Minneapolis: University of Minnesota Press, 1980). For Pal–estine, see Christopher Marshall, Warfare in the Latin East, 1192-1291 (Cambridge: Cambridge University Press, 1992); and R. C. Smail, Crusading Warfare (1097–1193) (Cambridge: Cambridge University Press, 1956). 16. M. E. Mallett and J. R. Hale, The Military Organization of a Renaissance State: Venice, c. 1400 to 1617 (Cambridge: Cambridge University Press, 1984), 47. 17. See Carmela Pescador, “La caballeria popular en Leon y Castilla,” Cuadernos de Historia de Espana 23-24 (1961): 101-238; 35-36 (1962): 56-201; 37-38 (1963): 88-198; J. F. Powers, A Society Organized for War: The Iberian Municipal Militias in the Central Middle Ages, 1000-1284 (Berkeley: University of California Press, 1988); and from a later period, Johann Hellwege, Zur Geschichte der Spanischen Reitermilizen. Die Caballeria de Cuantia unter Philipp II. and Philipp III. (1562-1619) (Wiesbaden: Steiner, 1972). For the military basis of the Stanleys’ power, see M. J. Bennett, “`Good Lords’ and ‘King-Makers’: The Stanleys of Lathom in English Politics, 1385-1485,” History Today 31 (July 1981): 12-17. 18. Robert Hardy, Longbow: A Social and Military History (Cambridge: Stephens, 1976); and Jim Bradbury, The Medieval Archer (New York: St. Martin’s, 1985), 71 ff. ; are useful popular surveys with good bibliographies. 19. Cf. John E. Morris, The Welsh Wars of Edward I, reprint of 1901 ed. (New York: Haskell, 1969); E. Miller, War in the North: The Anglo-Scottish Wars of the Middle Ages (Hull: University of Hull Publications, 1960); R. G. Nicholson, Edward III and the Scots: The Formative Years of a Military Career, 1327-1335 (London: Oxford University Press, 1968); A. D. Carr, “Welshmen and the Hundred Years’ War,” Welsh History Review 4 (1968): 21-46. 20. C. Carrere, “Aux origines des grandes compagnies: la compagnie catalane de 1301,” in Recrutement, mentalites, societes. Colloque internationale d’histoire militaire, 1974 (Montpellier: University Paul-Valery, 1975), 1-7; Roger Sablonier, Krieg and Kriegertum in der Croniea des Ramn Muntaner. Eine Studie zum spatmittelalterlichen Kriegswesen auf grund katalanischer Quellen (Bern: Lang, 1971). 21. John Keegan, The Face of Battle, Vintage ed. (New York: Random House, 1977), 115-16, and Johann Huizinga, The Waning of the Middle Ages, Anchor ed. (New York: Doubleday, 1954), 9 ff. Cf. also Georges Duby, The Early Growth of the European Economy: Warriors and Peasants from the Seventh to the Twelfth Century, tr. H. B. Clarke (Ithaca, N.Y: Cornell University Press, 1973); J. R. Hale, “Violence in the Late Middle Ages: A Background,” in Violence and Civil Disorder in Italian Cities 1200-1500, ed. L. Martines (Berkeley: University California Press, 1971), 19-37; and B. A. Hanawalt, “Violent Death in Fourteenth- and Early Fifteenth-Century England,” Comparative Studies in Society and History 18 (1976): 297–320, for further treatments of aggressive, violent behavior during this period at all social levels. 22. M. M. Poston, “The Costs of the Hundred Years’ War,” in Essays in Medieval Agriculture and General Problems of the Medieval Economy (Cambridge: Cam–bridge University Press, 1973), 63-80, and Geoffrey Parker, The Army of Flanders and the Spanish Road (Cambridge: Cambridge University Press, 1972), 179 ff. 23. Morris, Welsh Wars, 92-93. 24. J. M. W. Bean, The Decline of English Feudalism, 1215-1540 (Manchester: Manchester University Press, 1968), is an excellent case study in the competing legalisms that denatured so many chivalric ideals. Cf. also Bryce Lyon, From Fief to Indenture: The Transition from Feudal to Non-Feudal Contract in Western Europe (Cambridge, Mass. : Harvard University Press, 1957). 25. A good case study of this process in the last stages of the Hundred Years’ War is A. J. Pollard, John Talbot and the War in France, 1427-1453 (London: RHS, 1983), 18-101. Maurice Keen, Chivalry (New Haven, Conn.: Yale University Press, 1984), argues for the essentially secular, military character of the knight at this period. Cf. Keen, “Brotherhood in Arms,” History 57 (1962): 1-17; and M. G. A. Vale, War and Chivalry: Warfare and Aristocratic Culture in England, France and Burgundy at the End of the Middle Ages (Athens: University of Georgia Press, 1981). 26. Cf. C. Warren Hollister, The Military Organisation of Norman England (Oxford: Clarendon, 1965); S. Harvey, “The Knight and the Knight’s Fee in England,” Past and Present 49 (1970): 3-43; and John Schlight, Monarchs and Mercenaries: A Reappraisal of the Importance of Knight Service of Norman and Angevin England (Bridgeport, Conn.: University of Bridgeport Press, 1968). 27. Joseph F. O’Callaghan, A History of Medieval Spain (Ithaca, N.Y: Cornell University Press, 1975), 148-49, 280-81. 28. H. Grundman, “Rotten and Brabanzonen. Soldner-Heere im 12. Jahr–hundert,” Deutsches Archiv fur Erforschung des Mittelalters 5 (1941-42): 419-92; and J. Boussard, “Les mercenaires au XIIe siecle. Henri II Plantagenet et les origines de 1’armee de metier,” Bibliotheque de l’Ecole des Chartes 106 (1945-46): 189-224, remain excellent for the origins and dynamic of the early mercenaries. Useful too is Paul Schmitthenner, Das freie Soldnertum im abendlandischen Imperium des Mittelalters (Munich: Beck, 1934). 29. Maurice Keen, The Laws of War in the Late Middle Ages (London: Routledge, 1965), 19 and passim. J. W Sherborne, “Indentured Retinues and English Expeditions to France, 1369–1380,” English Historical Review 79 (1964): 718-46; and Burleigh, Prussian Society, 72-73, 134 passim..
31. Philippe Contamine, “Les compagnies d’aventure en France pendant la guerre de Cent ans,” Melanges de l’Ecole fran~aise de Rome, Moyen Age, Temps modernes 87(1975): 365-96, is a recent survey. The companies’ activities are presented in a broad context in Edouard Perroy, The Hundred Years’ War, tr. W B. Wells (London: Eyre and Spottswood, 1951), 154 passim. Anthony Mockler, The Mercenaries (New York: Macmillan, 1969), 25 ff., is a popular summary. 32. The best overview in English is M. E. Mallett, Mercenaries and Their Master: Warfare in Renaissance Italy (Totowa, N.J.: Rowman, 1974). G. Trease, The Condottieri, Soldiers of Fortune (New York: Holt, Reinhart, 1971), is more colorful. Cf. also D. P. Waley, “Condotte and Condottieri in the Thirteenth Century,” Proceedings of the British Academy 61 (1976): 337-71; and the case studies by W. M. Bowsky, “City and Contado, Military Relationships and Communal Bands in Fourteenth-Century Siena,” in Renaissance Studies in Honor of Hans Baron, ed. A. Molho, J. A. Tedeschi (DeKalb: Northern Illinois University Press, 1971), 75-98; and M. E. Mallett, “Venice and Its Condottieri, 1401-54,” in Renaissance Venice, ed. J. R. Hale (Totowa, N.J.: Rowan and Littlefield, 1973), 121-45. W. Block, Die Condottiere. Studien fiber die sogennanten “unblutige Schlachten” (Berlin, 1913) remains a useful operational study of condottieri warfare. 33. C. T. Allmand, “War and Profit in the Late Middle Ages,” History Today 15 (1965): 762-69, is a useful overview. Cf. also Richard Bean, “War and the Birth of the Nation State,” Journal of Economic History 33 (1973): 203-21. 34. J. Duidik, Hussitisches Heerwesen (Berlin, 1961), is a detailed military analysis. Cf. F. G. Heymann, John Ziska and the Hussite Revolution (Princeton, N.J.: Princeton University Press, 1955), 57 ff. 35. Cf. J. F. Verbruggen, “Un plan de bataille du due de Bourgogne (14 septembre 1417) et la tactique de 1’epoque,” Revue Internationale d’Histoire Militaire 20 (1959): 443-51; and G. Grosjean, “Die Murtenschlacht. Analyse eines Ereigenesses,” in Actes du Ve Centenaire de la bataille de Morat (Fribourg and Berne, 1976), 51 ff. 36. Richard Vaughn, Valois Burgundy (Hamden, Conn.: Archon, 1975), 123 ff., is a good English survey. Cf. also C. Brusten, L’armee bourguignonne de 1465 a 1468 (Brussels, 1963); and “L’armee bourguignonne de 1465 a 1477,” Revue internationale d’histoire militaire 20 (1959): 452-66. 37. Cf in particular Philippe Contamine’s massive Guerre, etat et societe d la fin du Moyen Age. Etudes sur l’armee des rois de France, 1337-1454 (Paris and The Hague: Mouton, 1972); and Paul D. Solon, “Popular Response to Standing Military Forces in Fifteenth-Century France,” Studies in the Renaissance 19 (1972): 78-111. 38. GilbertJ. Millar, Tudor Mercenaries and Auxiliaries, 1485-1547 (Charlot–tesville: University Press of Virginia, 1980). 39. For the Swiss, Eugen von Frauenholz, Entwicklungsgeschichte des deutsche Heerwesens, vol. 2, Das Heerwesen der Schweizer Eidgenossenschaft in der Zeit des freie S6ldnertums (Munich: Beck, 1936); and Walther Schaufelberger, Der alte Schweizer and sein Kreig. Studien zur Kreigsfuhrung vornehmlich im 15. Jahr–hundert, 2nd ed. (Zurich: Europa, 1966), remain strong on the military side. Albert Winkler, “The Swiss and War: The Impact on Society of the Swiss Military in the Fourteenth and Fifteenth Centuries” (Ph.D. diss., Brigham Young University, 1982), includes an excellent bibliography; K. W. Deutsch and H. Weillenmann, “Die militarische Bewahrung eines sozialen Systems: Die Schweizer Eidgenossenschaft im 14. Jahrhundert,” Beitrage zur Militdrsoziologie, Khmer Zeitschrift fdr Soziologie and Sozialpsychologie, Sonderheft 12 (1968): 38-58, is more concise. Schaufel–berger, Der Wettkampf in der alten Eidgenossenschaft. zur Kulturgeschichte des Sports von 13. his ins 18. Jahrhundert (Bern: Haupt, 1972), establishes the importance of military exercises at the community level as a means of developing individual efficiency and group cohesion. 40. For the Landsknechts’ socio-economic matrix, see Reinhard Baumann, Das Soldnerwesen im 16. Jahrhundert im bayerischen and siiddeutschen Bei–spiel (Munich: W61fle, 1978). Fritz Redlich, The German Military Enterpriser and his Work Force, vol. 1 (Wiesbaden: Steiner, 1964), 14 passim, is still the best English account. Eugen von Frauenholz, Entwicklungsgeschichte des deutsche Heerwesens, vol. 3, Das Heerwesen des Reiches in der Landsknechtzeit (Munich: Beck, 1937); Baumann, Georg von Frundsberg. Der Vater der Landsknechte (Munich: Suddeutscher Verlag, 1984); and M. Nell, Die Landsknechte. Entstehung der ersten deutschen Infanterie (Berlin: Ebering, 1914), provide the operational data. G. Franz, “Von Ursprung and Brauchtum der Landsknechte,” Mitteilungen des Instituts fur osterreichische Geschichtsforschung 61 (1983): 79-98, is a useful general introduction. 41. Most familiarly in Michael Roberts, “The Military Revolution, 1550-1660,” in Essays in Swedish History, ed M. Roberts (London: Weidenfeld and Nicolson, 1967),195-225. 42. Parker, Army of Flanders, 185 ff. This entry was posted in Articles and tagged 15C, 16C, early medieval, Eastern Europe, England, High Middle Ages, Hungary, Iberia, Islamic, Italy, Late Medieval, Muslim, Palestine, Prussia, Raids, Scotland, Sicily, Spain, Swabia, Tactics, Teutonic Knights, Venice, Wales. Bookmark the permalink.